I didn’t have a good reason to make this dessert. Ok, in the interest of honesty, I rarely have a good reason to make any dessert. But this one seemed a whole let less logical than most. Most treats that I make are a chance for me to experiment and have some fun in the kitchen. This wasn’t like that. 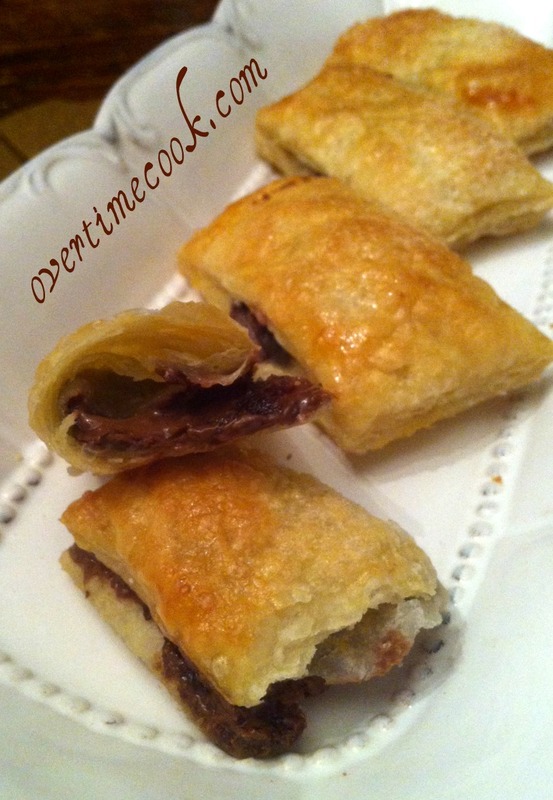 I took one delicious ingredient, Nutella (or in my case, a non-dairy version of it) and stuffed it inside another super delicious ingredient, namely, puff pastry. It’s simple math, really. How could it equal anything but delicious? And just like that I pretty much gave you my recipe. It’s that very simplicity that makes me glad I made this dessert. The number one complaint that I get from friends of mine (read: busy women with families to take care of and homes to run) regarding the desserts I post on this blog is that they are too complicated, that they require too much effort. When I described the process involved in making these decadent treats to a friend of mine, her reaction was one of delight: “That is exactly the kind of dessert recipe I look for.” This one is for you, busy moms of the world. If you are concerned that the simplicity and lack of effort means you are compromising on taste here, fear not. I don’t know that any dessert I have ever made has ever gotten a more universally positive reaction. Besides for the chocolate haters. But we don’t talk about those poor souls. If you are pressed for time, or simply love Nutella, give these a whirl. Your waistline may hate me, but your tastebuds will thank me. 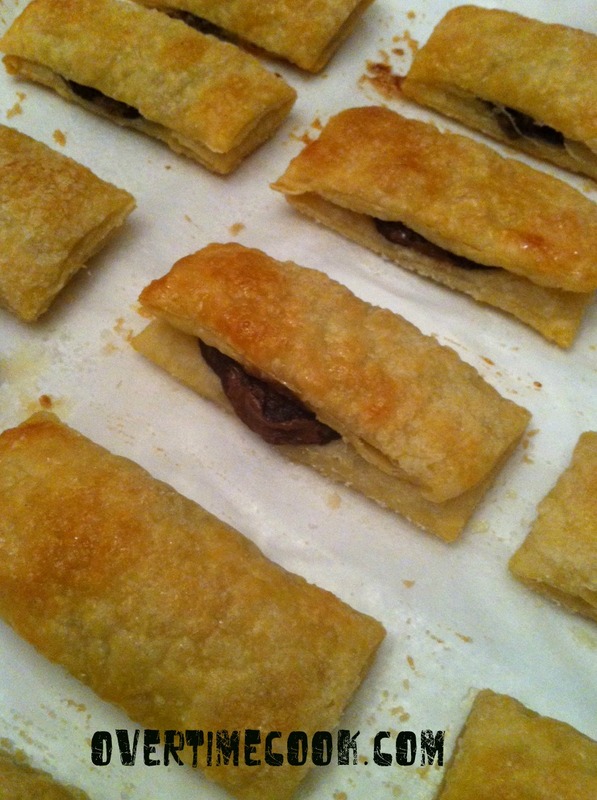 When puff pastry is defrosted enough to be pliable, but not overly defrosted so that it is too soft to handle, spoon about 1/2-3/4 of a teaspoon of Nutella onto the center of each square. (No need to measure!) Fold the square over and pinch around the edges to seal. Lay the sealed rectangles on the prepared cookie sheet. Brush with egg and sprinkle with granulated sugar. Bake at 350 for 25-27 minutes, or until golden brown. Thanks for stopping by, hope you like these! Oh my gosh – thank you! What’s the non-dairy version of Nutella that you used? We probably have it here, and I’d love to make this for dessert for Shabbos! Glad you like them Rivky! I used a chocolate hazelnut spread made by an Israeli company called Schneiders. I know they sell it in my local grocery stores. Hope you find it! My gosh – those are some dangerously amazing looking pastries! You can’t get any easier than this and they look fantastic! My kids would absolutely LOVE these. Thanks for posting. I did this several months ago…too easy and somewhat addictive! I love that you added the sprinkling of sugar on the top. OK what am I doing wrong? I tried to make something like Arny’s chocolate turnovers and sealed the edges with egg white. It didn’t stay sealed and the chocolate ran all over. Then I sealed them with water using a different chocolate and the same thing happened. I’m sorry you had trouble with this. I actually didn’t use anything to seal it. The problem could be that you overstuffed them. Also, did you use Nutella? If it was something else, the texture might be too runny. If you want to email me I can try to help you figure out what went wrong. Overtimecook at gmail dot com. 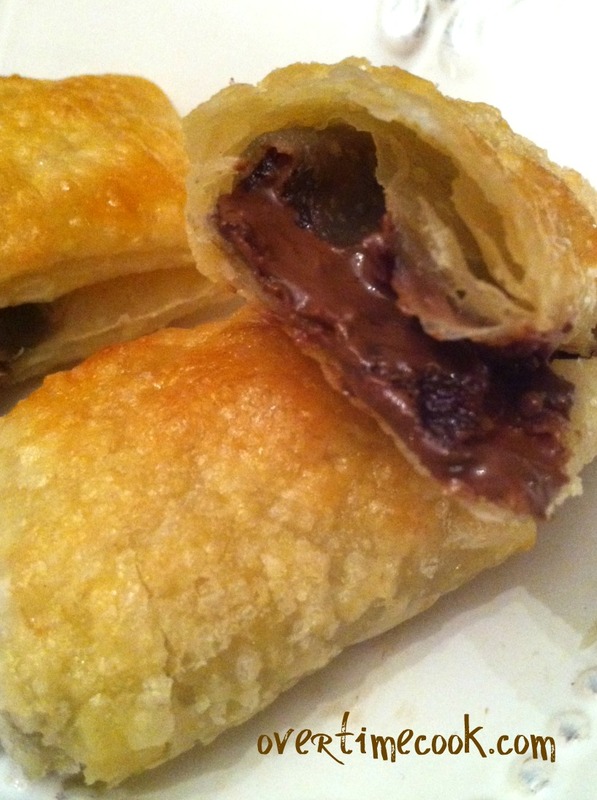 Oh yum….nutella and puffed pastry are a perfect combo! I do something similar with crescent rolls and they are always a hit! I have only one word… wow! Loved them, my kids loved them, my husband loved them…the dog would probably have loved them if I had given him one! This is definitely a keeper in my house. My dessert for tonight is planned! !